Hello all! This post is coming to you post-sugar high. We had only two trick-or-treaters come to our door last night and the Munchkin pooped out pretty early to even bother doing a full round of our complex. So Brett and I gorged on our leftover Halloween candy. Yeah...not a good idea! Talk about a tummy ache! I wish I could spend the day sipping peppermint tea and knitting, but alas, life with a 3 year old never warrants a quiet moment to do just that. The day is going to be spent doing the errands that were never done yesterday. Oh fun. In the meantime, here's one of the WIPs that I'm currently working away on for The Carefree Cowl Knit-along, hosted by Shannon of luvinthemommyhood. If you think you can knit up a cowl before November 9th (that's only 8 days away...totally do-able!) 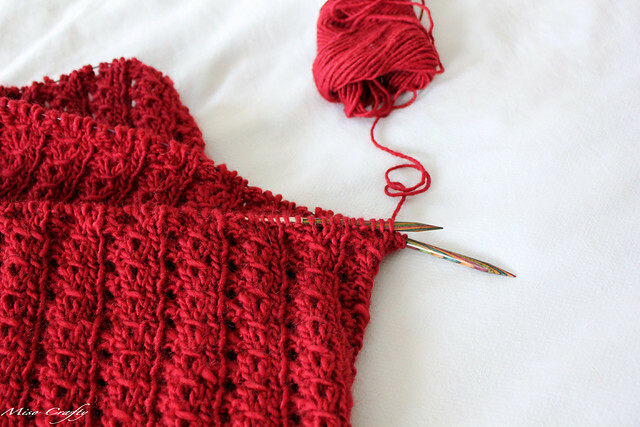 you should knit along and sign up here. The cowl I chose to knit is the Stockholm Cowl by Julie of Knitted Bliss. So far it's coming along pretty swell, although I wish it was knitting up faster. The pattern was originally knit in 2 panels before being sewn together, but Julie notes that the cowl can be knit in the round (she just didn't have a big enough circular to do so). Being one to avoid having to sew whenever possible, I decided to go the in-the-round route. Phew! 252 stitches around, trying to get a 14" width...can you say "knitting black hole"?? I've been knitting and knitting and knitting and it seems like my cowl is not getting any bigger! Don't get me wrong, the pattern is very memorable and therapeutic to knit, and the overall lace pattern is lovely to look at...but wow-y zow-y! It's a lot of knitting! The yarn I'm using (Lamb's Pride Worsted) is one that I found in one of my craft boxes a few weeks ago. I distinctly remember purchasing this yarn to use in my graduating collection for school but had decided halfway into the school year to weed out this colour from the rest of the collection. I didn't have the heart to get rid of it back then, so here it is today...being turned into a lovely cowl. To date I'm only at the halfway mark in achieving the called for width. A part of me is wondering if I should just stop at 10", but the other part is loving the idea of having this massive cowl wrapped around my neck on über cold days. I guess we'll see how I feel about it in a few days. The plan now is to dedicate the next few days to knitting this and another project solely, in hopes that I'll get them both finished, so that I can concentrate on the other projects that I have on the go. I'll let you know how that works out! Have a happy crafty week! I knit my Stockholm scarf in the round and I promise, the finished product is totally worth all those rounds of 252 sts! Want. Tanis. Dipped. Infinity. So. Bad... new year's gift to myself; it'll have to wait!!! I love your cowl though. It makes me crave big droopy cowls and red. 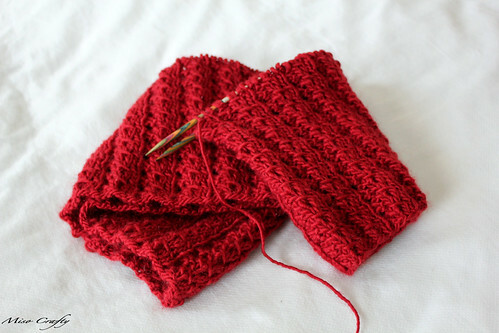 I've never knit with red before!